Humble but important railway joined the county for 55 years of the five villas, joining with the trunk of NORTE, north of Zaragoza Spanish through the Ebro After several projects that sought different routes opening was achieved in 1915, and two phases, and the railway between Sádaba Gallur, point with the broad gauge railway and the Imperial Canal of Aragon, trought the important town of Ejea de los Caballeros. And facilitated the railroad in a way the economic and social development of a region with low population density and little industry whose main activity is focused on agricultural production. Although we attempted to link this railway called Irati to reach Pamplona,?or been included in the draft Iberian rail link metric gauge finally happened this railroad no single antenna major broad gauge line. 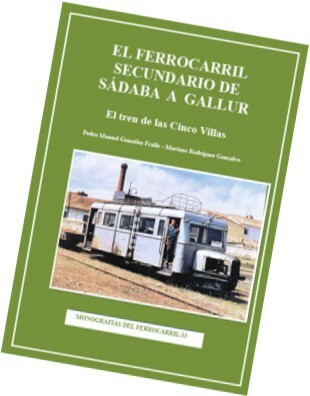 The improvement of rolling stock with small type Zaragoza vehicles for passengers, and cargo locomotive Batignolles, was not enough for the battered economic conditions of this railway, which had to close down on July 8, 1970. Attention to management plans that allowed the creation of areas irrigated by canal Bárdenas, building towns and settlement is paid in addition to the usual topics describing the infrastructure, stations, rolling stock and services in the railway. Size: 29 X 21 X 1 cm.